Atlanta — Atlanta ranks No. 11 among the top 25 most congested cities in the U.S. — significantly lower than other major U.S. cities across the nation, including Boston (No. 1), Washington D.C (No. 2), Chicago (No. 3) and New York City (No. 4), according to data collected in 2018 by INRIX Research. 2017 data collected by INRIX ranked Atlanta No. 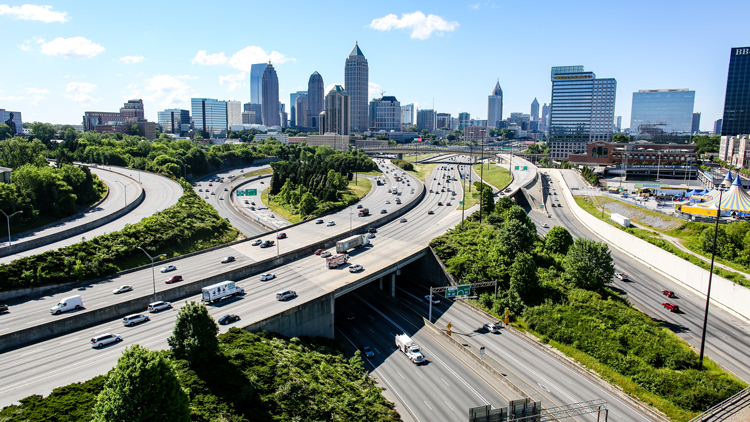 4 in the U.S.
Northwest Corridor Express Lanes — Opened to traffic in September 2018, this project added nearly 30 miles of fully reversible, tolled lanes along the I-75 and I-575 corridors northwest of Atlanta. The new lanes have significantly reduced congestion along the I-75 Corridor, cutting average travel times in the general purpose lanes in half and reducing the total time of both morning and evening rush hour. Within four months of opening, commuters took more than 2.5 million trips in the new express lanes. I-75 South Metro Express Lanes — This system of fully reversible, barrier separated toll lanes runs 12 miles along I-75 south of Atlanta. The lanes offer more reliable trip times for motorists and have significantly reduced congestion in the corridor. I-85 Express Lanes Extension — Opened to traffic in November 2018, this project added 10 miles of new tolled lanes north of the existing I-85 Express Lanes to help improve traffic flow, increase options and provide more reliable travel times for motorists and to serve transit and vanpool riders. Transform 285/400 — Under construction since late 2016, this project will reduce traffic congestion and enhance safety in the area near the I-285/SR 400 interchange in north metro Atlanta. This priority project adds new flyover ramps, new collector-distributor lanes and other facilities to aid east-west travel along I-285 and north-south travel along SR 400. The project will improve 4.3 miles of I-285 from west of Roswell Road to east of Ashford Dunwoody Road and 6.2 miles along SR 400 from the Glenridge Connector to Spalding Drive. The project will be completed in late 2020.